NEW! 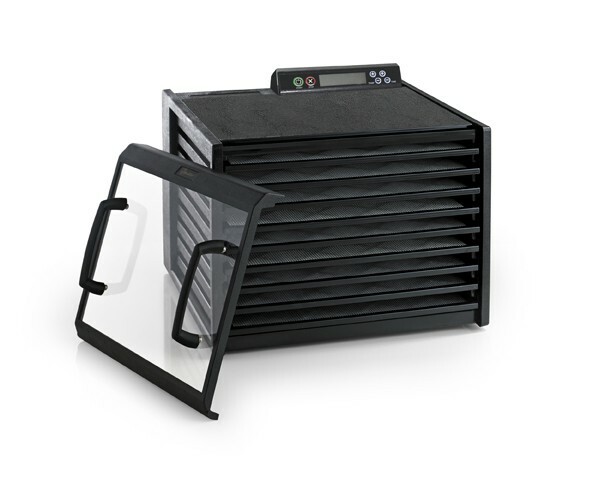 Excalibur delivers on a NEW Digital Clear Door Dehydrator with Timer for the latest in drying technology, now available from Harvest Essentials. Excalibur has FINALLY gone and done it! The latest addition to their popular 9 tray timer series is the Digital Edition. This Excalibur 9 Tray Food Dehydrator, model 3948CDB, replaces the old analog controller with a new two-time, two-temperature Digital Controller, to help speed up the drying process. To complete the upgrade, Excalibur delivers this model with the latest Clear door to ensure you can keep tabs on your drying process without having to open the door at any time. The new digital controller's 2-time, 2-temperature design allows for setting the dehydrator at a higher temperature for a specified period of time and then have the temperature be reduced for the second timing/temperature cycle. The unit automatically adjusts after the 1st setting and turns off when the 2nd setting is complete. The new 48 Hour Digital Timer lets you set it and forget it. Once the cycle completes, the unit shuts off on its own. And not only that, but the digital controller includes an adjustable Thermostat with a temperature range of 95°F to 165°F. The temperature range can be set low enough to preserve active enzymes in fruits and vegetables. Inversely, it can also be set high enough to meet safety standards for dehydrating meat for jerky. When using the thermostat, the 3948CDB turns on automatically. 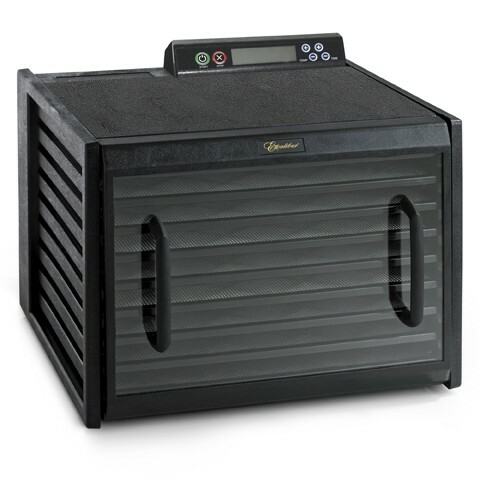 This Excalibur 9 Tray Food Dehydrator features Excalibur�s patented Parallex Horizontal Air Flow and Hyperwave Fluctuation Technology, the most efficient heating/drying combination on the market. Includes 9-large trays that measure 15" x 15" each. The 9 included Mesh screens are BPA Free so you can dry with confidence knowing the drying surface is BPA Free. The mesh sheets are used for everyday drying. 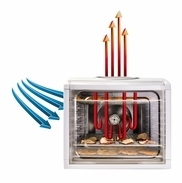 The 7-inch fan ensures even and consistent airflow across all surfaces from the 600 Watt heater. Includes Limited 10-year Manufacturer's Warranty. Savings of $29.95! FREE! Preserve It Naturally Book. Savings of $24.95! Digital controls and clear door are absolutely the way to go. Tried cheaper round type with no controls with vastly inferior results. The construction is less substantial than I imagined; it is plastic not metal. I should have figured that out from the weight and I am sure other reviews mentioned that fact. Everything takes time to learn; experimentation is easy with the abundance of produce on a market farm. Although the recommendation is always to use the "best"; often that goes to customers, so using the "best" parts of the "rejects" allows trying many methods and techniques. I wish there was more information on the two-heat method, that would sure help the learning curve. Similarly, suggestions on slice thickness would be a welcome addition to the instructions and/or recommended recipe book. I've only had the dehydrator for about a week and used it just twice. But the unit is performing as advertised and I've successfully dried this year's harvest of a variety of peppers. I've also made a large batch of beef jerky will great success. Next project up is taking on several huge basil plants. I can't wait to preserve some of that great garden freshness! We have used the dehydrator once a week since purchasing. It has worked well with no issues. We are quite pleased with our new dehydrator! Excellent product, very pleased so far. Would recommend to others. Wow, works perfectly. Made a great batch of beef jerkey, and several batches of dehydrated persimmons, totally care free, self timer and full temperature control, worked flawlessly. works, great, looks great. after years of using a small dehydrater my dream was to purchase the best, and that was excaliber. finally got it and love every feature. 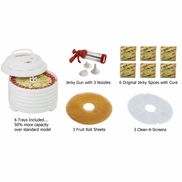 the quality is top notch, food drys evenly and consistant.the price is worth every penny and i hope to get years of use from this product. I love that it is made in the USA! I use dehydrators a lot. One of my other dehydrator was the Excalibur 5-tray. I took the plunge and purchased the Excalibur 9-tray and I'm so happy that I did. It holds true to quality drying. I like the electronic and the dual control. I love that it's quiet. I put it to use immediately. I'm very happy with this purchase. 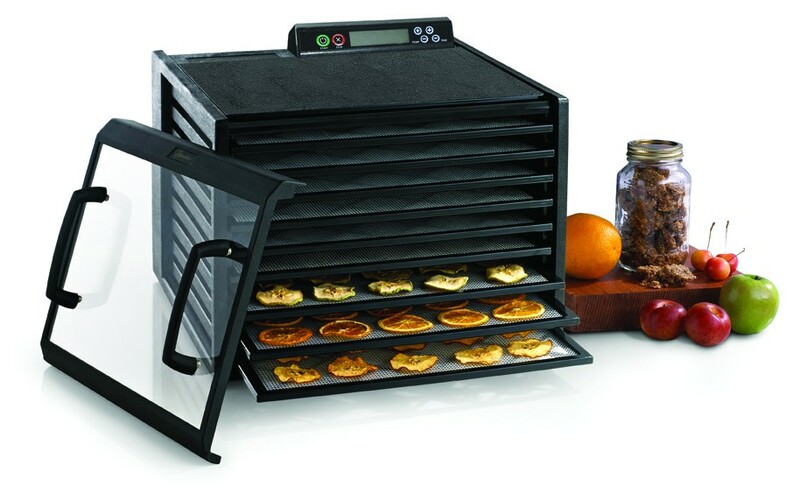 I have never owned such a great dehydrator. Fill the trays and let the dehydrator do the rest. When the time is up my dried products are ready. I received my Excalibur dehydrator just a few days after ordering and immediately put it to use to make granola, kale chips, and vegetable crackers, all of which came out fantastic! I follow a plants only, no oil, sugar, or salt lifestyle and am so happy to be able to make items without the unhealthy additions of store bought versions. Fresher and better tasting too! I will be using this dehydrator a lot! Harvest Essentials had the best price, free shipping, and now I can say, best service also. Thank you! I needed a dehydrator for a plant based class I am taking and had never used one before. The folks at Harvest Essentials were amazing! They were patient and extremely knowledgable about all of the products and helped me to select the one that fit my needs. I LOVE IT! It is simple to use and easy to clean. I know I will enjoy my dehydrator from years to come!! Just made a first batch of jerky and turned out great . It took less time than I suspected with 2 and half pound of meat. The most noticeable is the sound much quieter than my round dehydrator that I had for decades. No more rotating trays. What a treat! I like the functionality of being able to dry herbs at a low heat setting. The plastic trays have a removable flexible plastic sheet which is easy to use and clean. I was, however expecting the trays to be stainless steel as I am trying to steer clear of toxic plastics. So that revelation was disappointing. I chose to keep the dehydrator because I like everything else. I really like the even dehydration. It is better and faster than the another one we had. Putting it to good use this summer! First day...got the seasonings and the meat. Second day got the jerky finished. Bucket list Jerky home made... check. I absolutely love this thing. The digital component takes dehydrating to a whole new level. I replaced my Cabelas dehydrator with this one and can't say enough. I used to prepare 9 pounds of ground meat for jerky and it would take me 2 days to make that and now I can put 9 pounds of ground meat in the Excalibur and it's done in 6 hours. Very happy customer. Thanks so much for making the purchase easy and cheaper than buying on the Excalibur site directly! I am very happy with my new Excalibur 3948 CDB dehydrator. I soaked various nuts then dried them and they are wonderfully crunchy and so much more nutritious! I've also made almond butter from my dehydrated almonds - yum!! Made my first beef jerky, turned out great. Can't wait to dry some vegetables. Thanks. Love the product. it is so much more effective than my 20+ year old round dehydrator. One thing I didn't realize is that the picture shown has handles on the door. Mine did not include the handles for whatever reason, however there are holes where the handles should go...just noticed this two days ago after my initial run. Love that this unit has a timer, and allows you to set two different temperature settings. Unit arrived quickly. Best dehydrator ever! Dries MUCH faster and more evenly than cheaper units I've previously used. Have dried vegan dal soup, fruit leathers, various veggies, crackers and other soups for the larder so far. Harvest Essentials had the best price by far on this new model. Very pleased with this purchase! Turned out nicer than I had expected. The fan is super quiet. And it fits nine quart jars for making yogurt. It will fit half gallon jars too. That was my only question when ordering so I hope this helps someone else with the same question. Overall quality looks to be durable enough to be something that sits on the counter top. Controls are easy enough to learn for the settings, Nice blue backlight for the display. Im currently working on honing my yogurt making skills and excited to dry some food this year. Also the books that come with it look like a nice added bonus. I have been studying several different brands of dehydrators and thought I would pick this one because Excalibur finally made a clear door, but disappointed that it was not glass but some sort of clear plexiglass/plastic. I also am disappointed that this door while the machine is running vibrates (Noise) and I have to slide the door around for it to stop. The other thing that would be nice is if this Company made a light inside of it so you can see your food without opening the door. It would have also been nice if this Company (Excalibur) would made the door hinged. The other reason I did not go with the �other� brand name was that their machine was made in Thailand not the USA... but did love the other features of their machine. They had a light inside, the panel/electronic buttons was on the front of the machine verses the back of this machine. Overall the Excalibur machine does what you want it to do and that is Dehydrator your food(s) I like all the trays that it has. I am enjoying my new machine. I am pleased with the shipping and the arrive of my package from Harvest Essentials. They also had the better price of this Excalibur Dehydrator too. Thank you! Merchant's comment:Thank you for your comments. If we may provide some insight on your comments in regards to Excalibur. Excalibur opted to go the route of a polycarbonate door for cost, weight and durability reasons. Making the door out of glass creates a different set of issues altogether, making the item cost prohibitive, as well as the risk of breakage. All Excalibur doors rest on the top leading edge of the dehydrator by design, to allow air movement from the rear fan out the front edges of the door. As for a light being available, there are new dehydrators on the market (Tribest) that do offer a light, though they've been met with a lukewarm response simply because the spacing between the trays is narrow to the point that a light would not allow you to see onto each tray anyhow, and since a dehydrator is typically a longer cycle (versus cooking something in an oven) most people simply check on the status of what they are drying as time progresses. Great product, read the book to save time dehydrating. The dehydrator is good. It was missing one sheet and the customer service sent it immediately out. Works great! Please read the book, it is very help.